Fish and I rolled into Santa Cruz yesterday afternoon to hang with the good folks at the Re-Cycle Garage and join the Motorcycles & Misfits podcast in the evening. Topics of discussion included my ongoing busted-up-ness, Fish’s work with the CityBike Foundation for the Preservation of Front Tires, as well as a variety of current hot moto-news topics: the shrill, uninformed shrieking about AB 1824, our analysis of the MIC’s announcement on increasing women ridership, Fish’s 2018 Dirtbag Challenge build, Project SnoMoChop, and even a bit about Harley’s comically overpriced LiveWire. If you’re not familiar with the Motorcycles & Misfits podcast, it’s a weekly jam session that grew out of the Re-Cycle Garage down in Santa Cruz—check out page 29 of our October 2016 issue for more background on what they do—or just start listening. You can follow the Misfits on Facebook to stay on top of their shenanigans. If you’re in the greater Bay Area, they’re doing a Moto Food Ride on February 2nd, an all-day ride-and-chow featuring good roads and good food ’round Santa Cruz and Monterey counties. CityBike has been on the M&M podcast before—most recently, I dialed in for a chat on September 3rd. 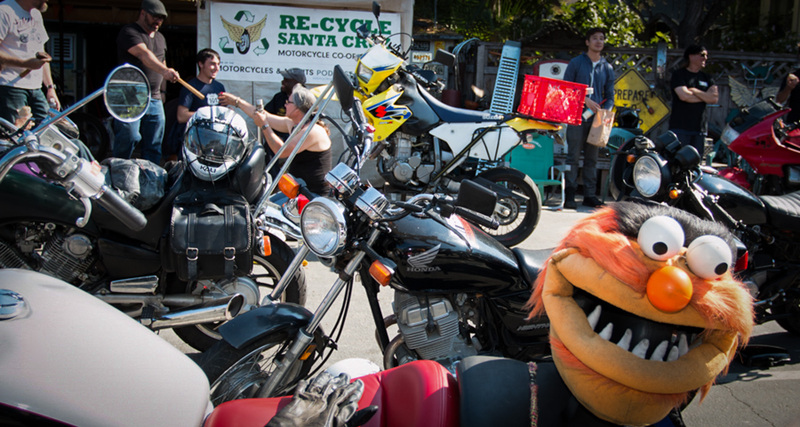 Back in 2016, Master of Puppets Angelica and I visited the Misfits to talk about lane splitting and my work with LaneSplittingIsLegal.com, and of course general tomfoolery here at CityBike. The Re-Cycle Garage / Motorcycles & Misfits crew. Photo lifted from their Facebook page.